Second draft copy of Last Request, a trunked novel. Looking insane. 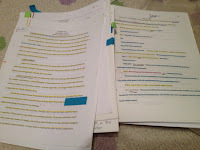 It didn't do much, because that manuscript is in a folder in my room. My fondness for this part of the process, when one can scribble in different colored pens to one's heart's content, goes very far back. When I was in elementary school and the teachers were trying to teach a simplified form of the writing process--for use in our future academic careers, of course--we wrote the sloppy copy (first draft), then we handed that in. The teachers would mark it a little bit. Then we were allowed to mark it up ourselves some, if we saw spelling or grammar that needed to be fixed, then we wrote it out again into a clean copy to be handed in. We wrote all over the hard copy, as well as giving a few paragraphs of thoughts and feelings on the piece, in every workshop class I've ever been in. So, all of college. 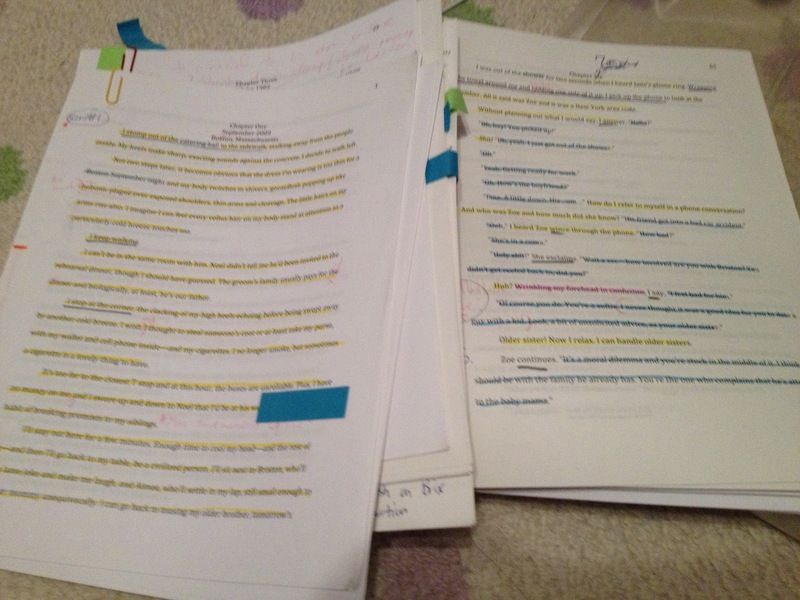 I've been printing out the manuscript in bunches, sitting with it, reading it through. If I like a certain line, I underline it with the orangey pen. Other than that, however, I haven't colored-coded anything. Whichever pen is convenient is the one that gets used to cross out. Or to scrawl out notes. Or make copyediting marks. Or notes to cut out words or cut out entire paragraphs (those are my favorites so far). I have scenes that could do with being cut. I have exposition that would be better as the first two chapters. I have useless words and sentences that could be better combined. But, for the most part, the big stuff is finished. Fact is, as much time as I spend on my computer, as much time as I spend reading the WIP and now writing on it, and though Word's Track Changes is very useful, I read the work differently when it's printed out on 8 1/2 X 11. I suppose it triggers a different part of my brain, maybe? 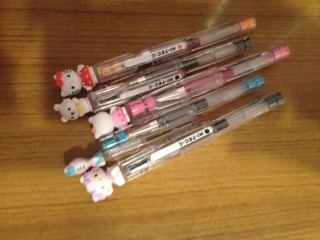 Besides, Word doesn't give me the pleasure of using Hello Kitty pens and writing on top of printed black ink. I wonder what it is about writing on top of your own writing that is so appealing? And what's the appeal of using colored pens to scribble all over it? It can't just be because the pens show so nicely against white paper. Is it the writer's instinct to criticize yourself on top of something you've already written? Or to be snarky about it?